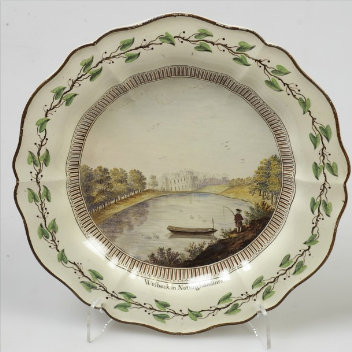 As I’m sure you’ll probably be aware the Wedgwood Collection, one of the most important industrial archives in the world and a unique record of over 250 years of British art, is under threat of being sold off. The Art Fund is hoping to purchase it for the nation intact, provided the final £2.74m of a total £15.75m fundraising target can be raised by 30 November 2014. Without wishing to pass political comment – what a strange world we live in when a great national treasure is put at risk for the sake of peanuts … not even small change in government terms. But what’s that got to with historic parks and gardens? Read on and find out…. 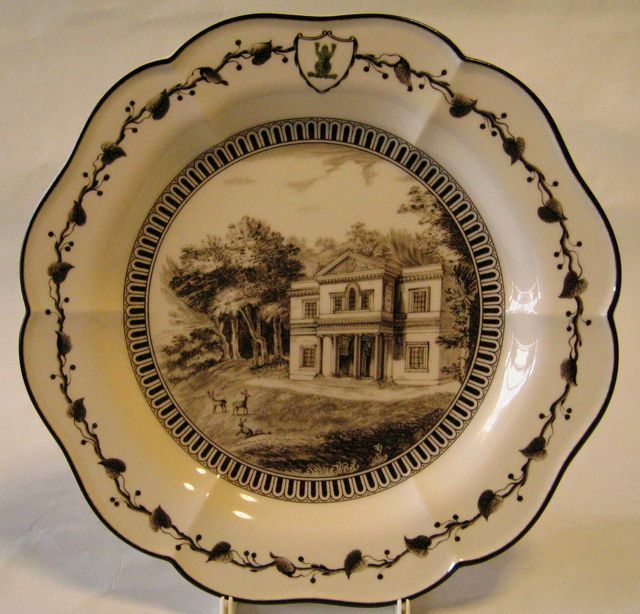 Perhaps the most famous Wedgwood connection with gardens dates from June 1774 when a notice appeared in several London newspapers, informing the nobility and gentry that tickets were available to see ‘a Table and Dessert service now set out’ at Wedgwood’s ‘new rooms in Greek Street’. 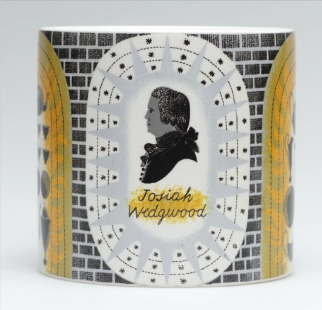 With this modest statement fashionable London society learnt about one of the most important and extravagant commissions to be carried out by Josiah Wedgwood and his partner Thomas Bentley. 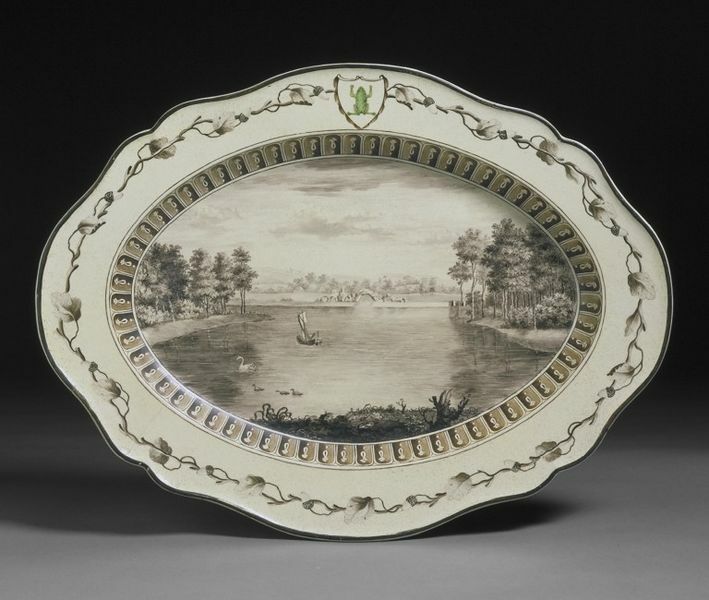 The service, now universally referred to as the ‘Frog Service’ because of the emblematic green frog on every piece, was commissioned by Catherine the Great, Empress of Russia for the new Chesme palace near St Petersburg. Built in the then fashionable English neo-gothic style the palace was nicknamed La Grenouillere because of its location on a frog marsh. 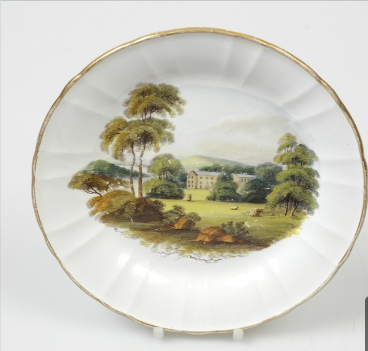 Catherine requested that each piece of the 50 setting dinner and dessert service, should be hand-painted with different views of British scenery, although she left the style and decoration up to Wedgwood. The order amounted to a total of 944 pieces decorated with 1,222 topographically accurate views. 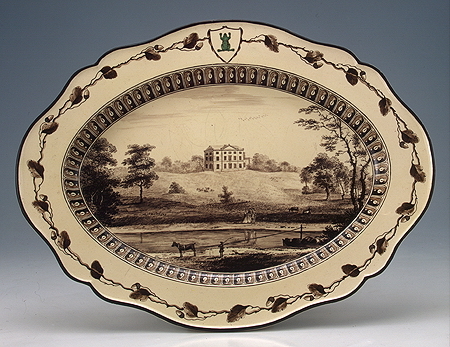 These were chosen Bentley and copied by a team of 30 artists employed at Wedgwood’s Chelsea decorating studios, from existing engravings and published topographical books, but also from pictures provided by landowners who were anxious to have their property depicted on the prestigious service. A catalogue was prepared and sent to the Empress with the location of each view. The majority of the service has survived and is now in the Hermitage Museum, St Petersburg. 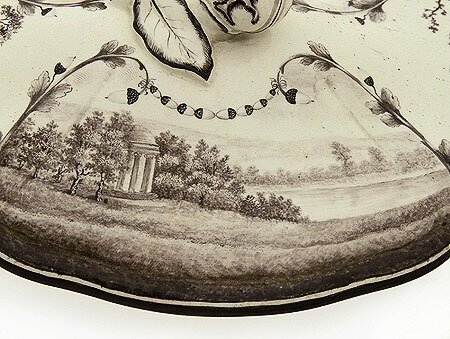 However a few other pieces, in some way imperfect, or not interesting enough to be included, remained in Britain. 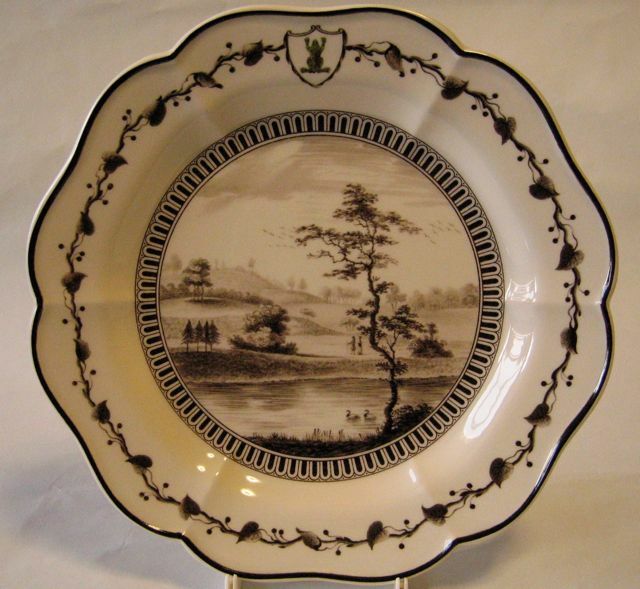 As a money maker, it was a failure (Wedgwood was paid a little more than £2,700 for a set which cost £2,612 to create). But as an advertisement, it was priceless. 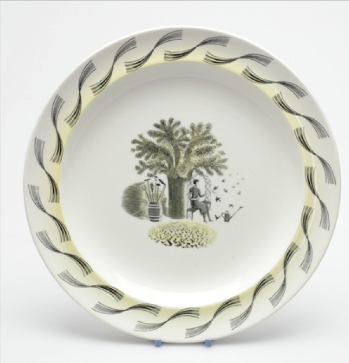 From 1995 Wedgwood began to recreate the service in “limited editions”..
Whilst Catherine’s frog service may have been the most prestigious work produced by Wedgwood it certainly wasn’t the only landscape-inspired work coming out from his workshops. Nor was it the most colourful. 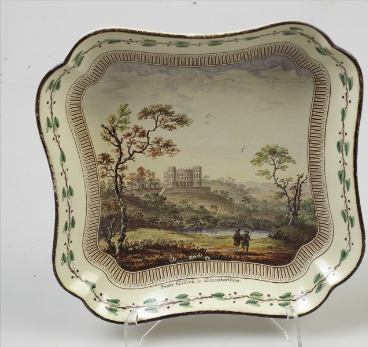 The view of Hackfall in the introduction to this post was one of a brightly painted series which also included other important country houses and their surroundings. 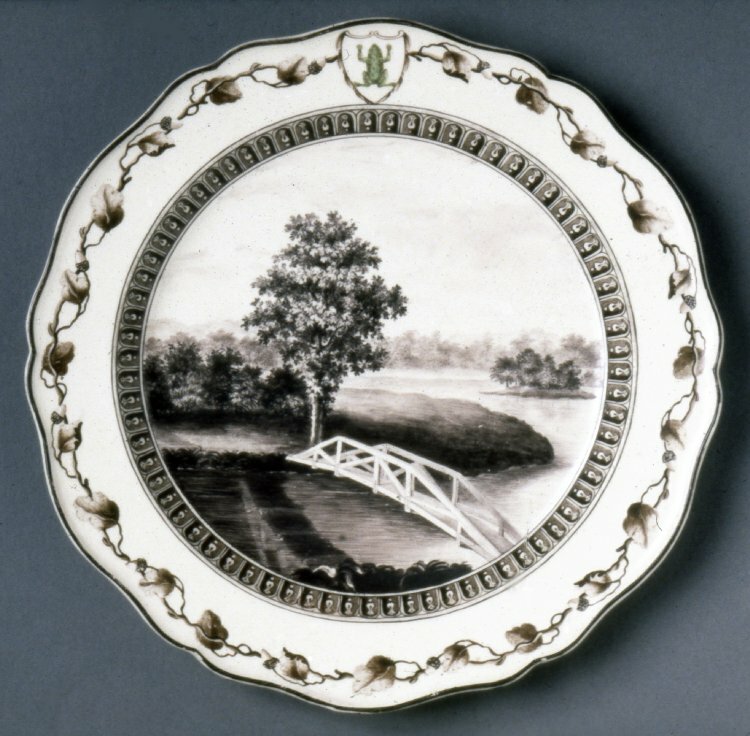 It now contains 80,000 historical pieces,ranging from early experiments for new bodies and glazes through to modern production as well as rare manuscripts and letters, pattern books, works of art and photographs, covering the 250-year history not only of the pottery produced, but of the Wedgwood family and their employees. 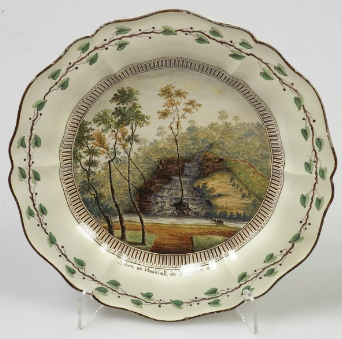 But there are other things of horticultural interest in the collection, although of course they also tell of contemporary politics, society, science and art. 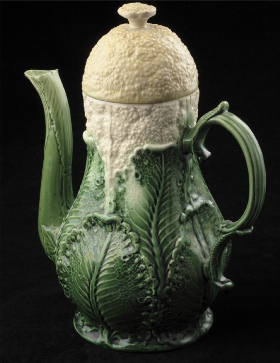 For example, this cauliflower coffee pot shows not only how coffee drinking was spreading among the middle class, but also how naturalistic forms, such as cabbages, melons and cauliflowers became popular in Georgian Britain, as part of the rise of the rococo. 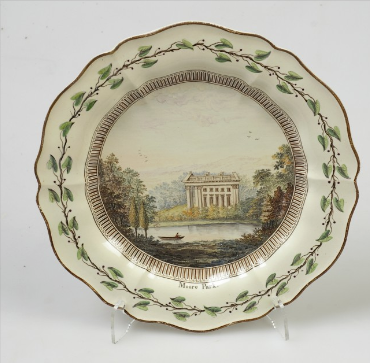 It also demonstrates Wedgwood’s constant search for innovation and his creation of ‘A Green Glaze to be laid on common white biscuit ware’ which is recorded as number 7 in his Experiment Book on 23rd March 1759, and which resulted in the unusual dark green used on such pieces. 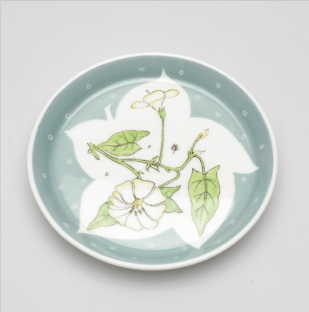 Teaware also has much social significance. 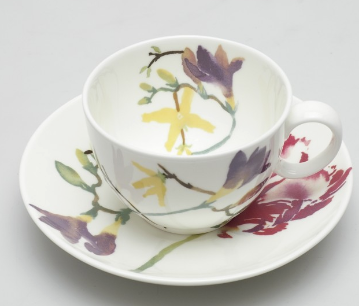 Although tea had been introduced into Britain from the middle of the 17th century , it became a fashionable and social drink during the 18th century, although it remained an expensive luxury item until import duties were abolished in 1784. 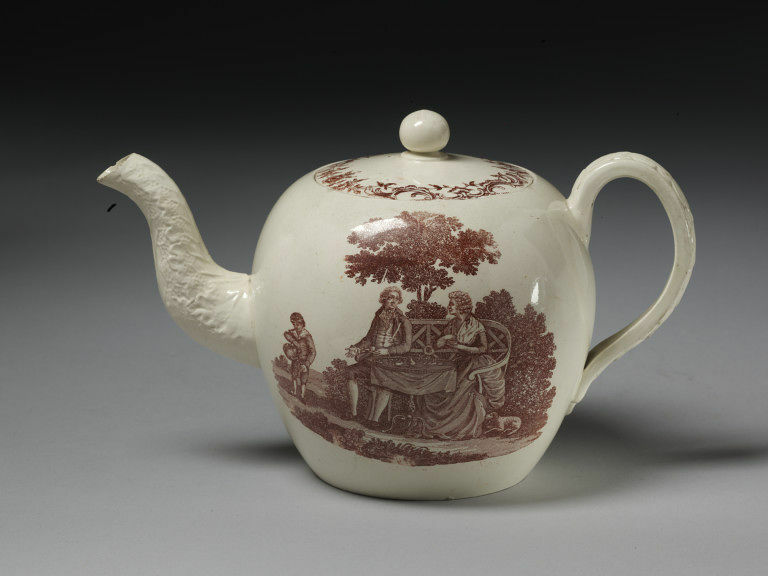 The design on the pot shows a well-dressed couple drinking tea in a garden, attended by a young black male servant who is pouring hot water from a kettle into a teapot. About 10,000 Africans are estimated to have been living in 18th century England, most working as, often unpaid, domestic staff. For their affluent owners these African servants were status symbols who, like the tea they were drinking, offered ‘exotic associations’. 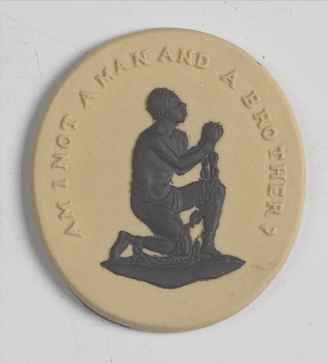 Such symbolism was significant for Josiah Wedgwood. 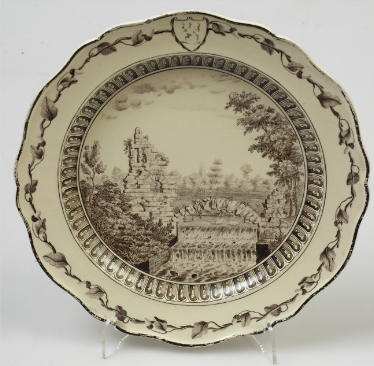 He is not only rightly celebrated as a pioneering innovator in the field of ceramics, but also importantly as a social reformer and philanthropist, and he took a leading role in the anti-slavery movement, and in factory reform. His interests embraced a wide range of topics from art and design, the improvement of transport by road and canal, cost accounting, education, factory management, new production methods, entrepreneurial activities and international marketing. He was a member of the Lunar Society which also included James Watt, Matthew Boulton, Erasmus Darwin, and Joseph Priestley. 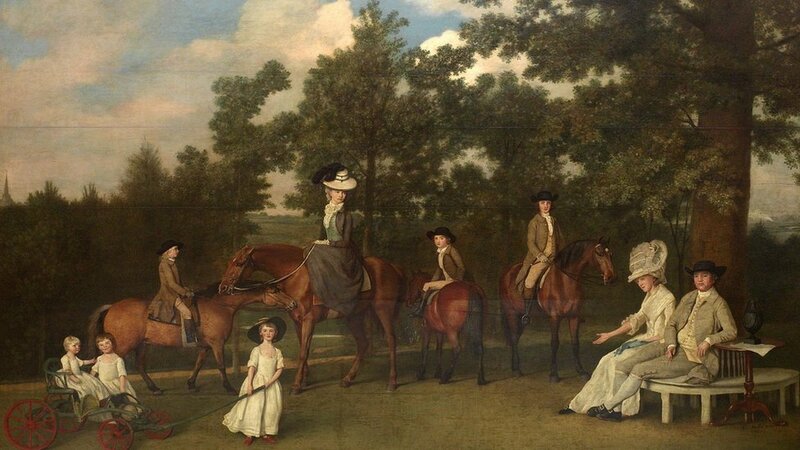 He knew artists like Joseph Wright from Derby, and George Stubbs who painted the Wedgwood family in the grounds of Etruria Hall. He must also have been at least vaguely interested in gardening: certainly as much as any other wealthy estate owner would have been. Painting on tile of Etruria Hall. James Bakewell, 1773. 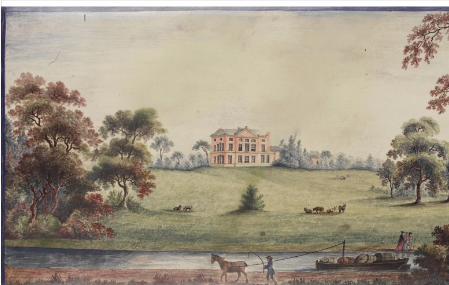 Etruria Hall, the mansion he built for himself and his family, had about 4 acres of grounds designed by William Emes, with a Chinese bridge, summer house, fish ponds and nurseries. but there is no early plan of the estate and the precise layout cannot be determined. But there are some surviving images including this painted tile. The house has endured many vicissitudes over the years but is now a hotel, having been used as the centrepiece for the Stoke Garden Festival in 1986. 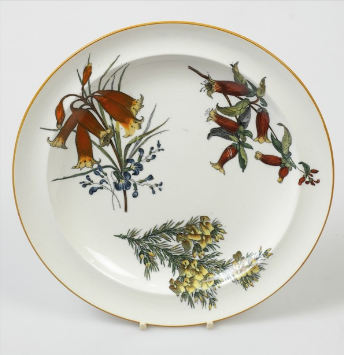 I thought I’d end by including a few images from the museum’s collection to show the range of other horticulturally-related material it contains…. and finally…because I included it in the title of the post…. 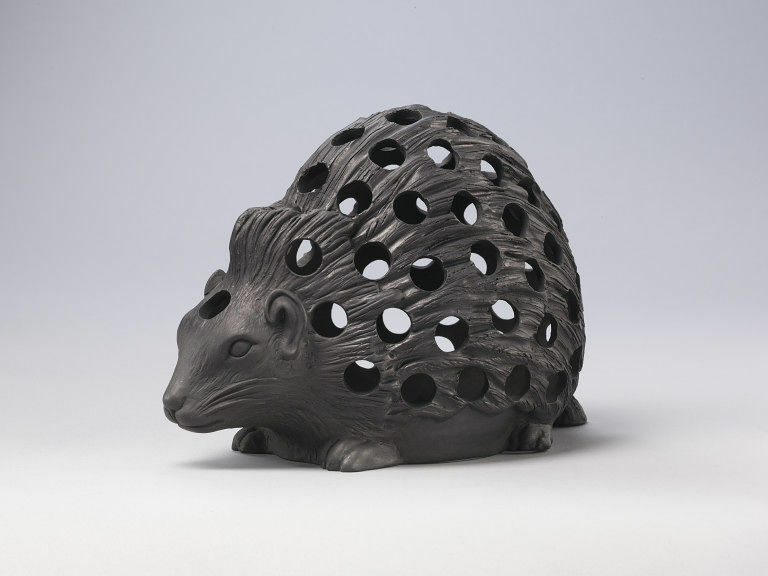 here’s a hedgehog …but a hedgehog with a horticultural role. This entry was posted in Uncategorized and tagged Belton, Eric Ravilious, Hackfall, Moor Park, Painshill, Stoke Gilford, Stowe, Trentham, Welbeck, William Emes. Bookmark the permalink.